I've often included hand creams in 'Products I've used up' posts but it's rare that I would dedicate a blog post to talking about them in depth. I suppose it isn't really something that you would overly think about, in buying a hand cream; I've tried so many over the years and usually just pick up whichever one is on offer! However, I've definitely found some to be better than others and here's a selection of the ones I've been using most recently. I should prefix this post by saying that I suffer from very dry hands, exacerbated by a skin complaint called pomphlox which makes my hands alternatively itchy and rashy and dry and cracked. Lovely. To combat this, I've found that there are only a few hand creams that can really help; and when it's at its worst, I usually have to reach for the E45 or a steroid cream. But in between bouts, I try to use products that aren't overly scented or that are particularly designed for dry skin. 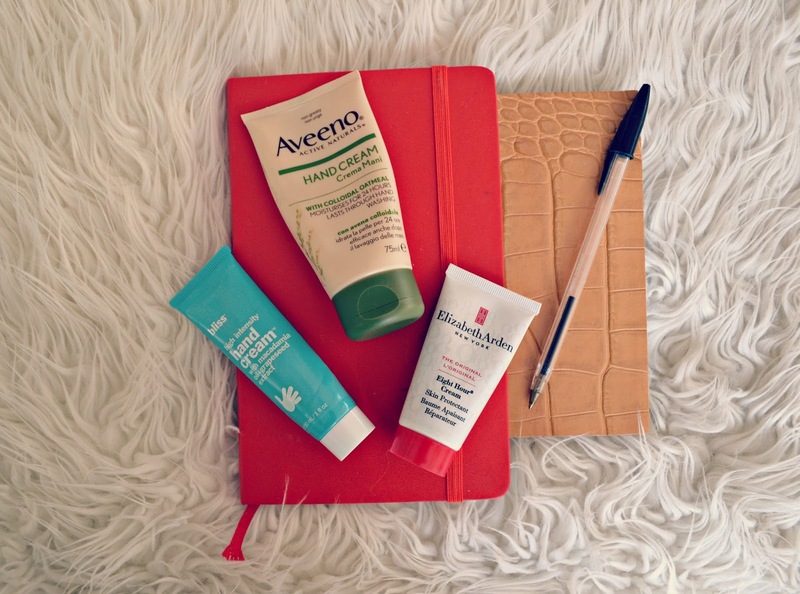 I have often spoken about The Body Shop hemp hand cream, which is one that I really like, and alongside this one, there's another more naturally suited product in the form of this Aveeno hand cream with colloidal oatmeal. This lasts through hand washing, which is something that really affects my hands; not the washing per se but any antibacterial hand wash (of the sort you would get at work or in public toilets) really flares it up. Hence, this is a great cream to keep in my bag or coat pocket; obviously I want to be able to wash my hands and applying this afterwards stops them feeling cracked and sore. Like The Body Shop hemp version, I wasn't keen on the scent at all (it is very oatmealy!) but I've got used to it now and it really has helped my hands so I can put up with that! It is priced at £5.49 but is definitely a worthwhile purchase. A lighter option comes from this Bliss High Intensity hand cream that I actually picked up as part of a set, with a lip balm. I didn't like the lip balm at all (it actually made my mouth more dry, if that is possible!) but this hand cream was just lovely. A lightweight, easily absorbed lotion, a little goes a long way and the smell is insane; it's been compared to Hawaiian Tropic suncream and it definitely has that summery, tropical vibe to it. I've since used this up and I would rebuy it but this one is slightly more expensive; for the largest size it's around the £20 mark and I did love the scent, but definitely didn't feel that it helped soothe my hands as much as the Aveeno cream did. Finally, the key player. Elizabeth Arden Eight Hour cream is such a classic; it's something I've had in my handbag for years since being introduced to it by a friend. This is a funny product; a tiny amount goes a long way, and it can be quite greasy, but I like to apply this in the evening and then put cotton gloves on overnight, to ensure soft paws in the morning. You can also use it on your feet to pamper them pre-pedicure or to ease dry, cracked heels. 50ml of this product is around £26 but this does last for years; it is definitely an investment but it is a multitasker that can also be used to soothe dry lips and treat any dry skin patches. So, there you have it; three of my favourite hand creams, all at slightly different scales of the spectrum in terms of pricing but all great products, if I had to pick a favourite it would probably be the Elizabeth Arden cream in terms of it's multiuse ability but I would probably repurchase them all!